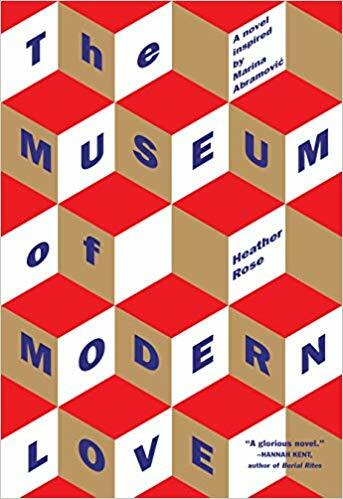 Heather Rose’s The Museum of Modern Love is a great title for a novel, but the subject, according to a recent review in PW is even more inventive. 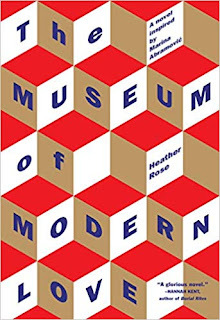 PW describes the book as “an exploration of love and convergence set against the backdrop of a work of art performed by Marina Abramovic at MoMA in New York City in 2010.” Surely our present period will beget numerous novels set against the background of the Trump presidency with the turmoil of The White House mirroring the inner conflicts of the characters— and even the pathetic fallacy becoming politicized. But Rose’s idea is truly original and recalls an artistic event that however transfixing may have vanished into the collective unconscious of a previous era. Remember the naked acolytes at the entranceways and the eyes of the artist? It was a little like one of those games where you lock into the gaze of someone waiting to see who will crack first, only Abramovic never budged. It would incidentally be interesting to find out if she ever met her match, if anyone tried to take on this Serena Williams of performance art. There was also sense in which Abramovic’s gaze acted like a tabula rasa in which you could either feel you were being seen or ignored depending on the penchant created by your own psychohistory. Imagine further someone writing a novel about the brothel which was the basis for “Les Desmoiselles d’Avignon” or painting Marina Abramovic. Sitting totally still, she made the perfect model. Are the Body Snatchers Invading?